Running shoes are designed to accommodate a wide variety of foot shapes and sizes, body types, and biomechanics. The challenge is matching the right shoes to each and every person. 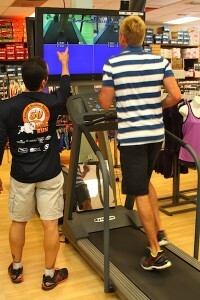 We offer a Free Gait Analysis with your shoe purchase on our in-store treadmill at each of our stores. Come in and let one of our expert shoe fitters analyze your gait and give you pointers as to how you can improve your running form. We also offer Free running form classes monthly. As you try out shoes on our treadmill, a video monitor will enable you to see how your gait will be affected by the shoes you are wearing and will help us to identify the correct category of shoe for you. If you are not comfortable on a treadmill, we will watch you walk or run outside. We will also take time to measure your feet and watch you walk without shoes. If you have your current walking or running shoes available, please bring them in so we can analyze them for wear patterns that give us more insight into your biomechanics. Also, please bring in any prescription orthotics if you will be wearing them with your new shoes. And, finally, we will spend a lot of time just talking to you and finding out more about you and your plans for the shoes; whether it be running, walking, working out or just wearing them for everyday use. Each use has different ramifications and plays a large part in us deciding which shoes we suggest for you to try. We also want to know about any past injuries, surgeries, or doctor recommendations so we steer you in the right direction.